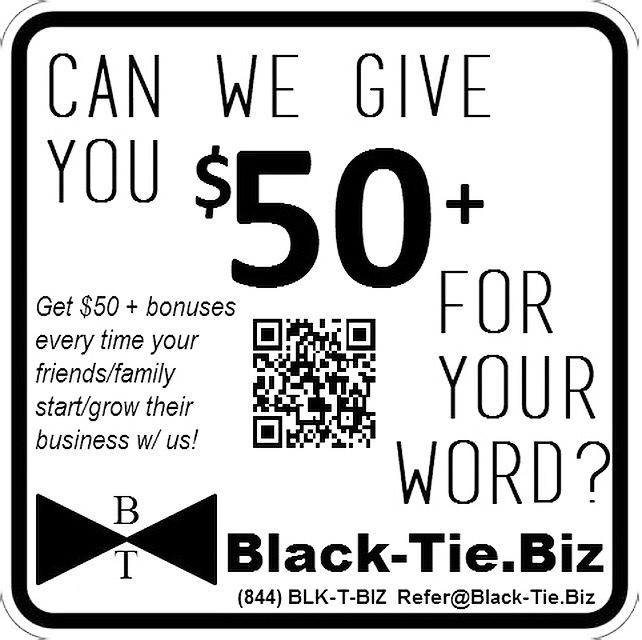 We pay $50+ for Referring Friends/Family seeking help in Starting their Businesses! Do you have Family, Friends, Co-Workers or Colleagues who need help with Tying their Business Ideas & Dreams into Reality? Think your community could use our services? Refer them here to get a 5% finder’s fee + $50 bonus (for services above $100) to start or grow their business! Since 2006, we’ve been an industry leader for helping small business from Start-to-“Business” with customized assistance at unbeatable prices! In addition to this, we also provide rewards & incentives to encourage others on their journey to entrepreneurship. Instead of hiring more salespeople, we prefer to pay you every time you refer friends, family, &/or co-workers who hires us to help them start or grow their business! 1. Always encourage your Friends, Family, &/or Co-Workers in their pursuit to Start or Grow their Business (whether its’ through us or not)! 3. After your referral secures payment for their desired services (takes 3-5 business days), wait until Friday of the same week it’s approved to receive your bonus! We’ll also pay for additional services they acquire as their business needs grow. You could literally get paid #eachandeveryfriday for supporting your own people! If you have any trouble with using this referral program for any reason, email refer@black-tie.biz or call (844) BLK-T-BIZ for same-day assistance.